This hand colored map is a copper plate engraving, dating to 1850 by the legendary American Mapmaker S.A. Mitchell, the elder. It represents Connecticut. This historically important map is extremely rare as it existed only in the 1850 edition of the Mitchell's Universal Atlas. 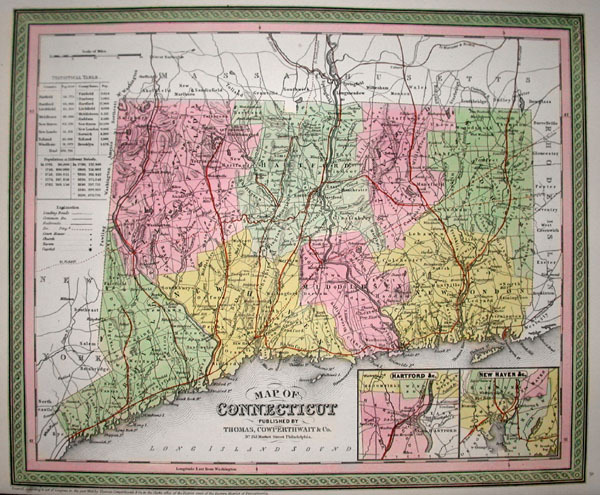 This map contains an inset map of Hartford and New Haven, as well as a statistical table. Political boundaries as well as major rivers, territories, and counties are carefully labeled. Also included are major canals, explorer's routes, roads, trading posts, and extant & proposed railroads. Further, all notable mountains, passes, and even important trading posts are labeled, as are bodies of water, rivers, mountains, islands, and sub regions. Most major national and local political distinctions are outlined and defined by vibrant color: reds, greens, yellows & browns. This map is dated and copyrighted, 1850.